^ Le Masson 1969, p. 13. ^ Dumas, Dunkerque, p. 13–15. ^ Jordan & Dumas 2009, p. 19–22. ^ 5.0 5.1 Jordan & Dumas 2009, p. 24–26. ^ 6.0 6.1 6.2 Dumas, Dunkerque, p. 16–17. ^ Jordan & Dumas 2009, p. 28–29. ^ Breyer 1973, p. 433. ^ Garzke & Dulin, p. 128. ^ Giorgerini & Nani, pp. 37–38. ^ Jordan & Dumas 2009, p. 98. ^ 13.0 13.1 Jordan & Dumas 2009, p. 44. ^ Dumas, Dunkerque 2001, p. 22. ^ 15.0 15.1 15.2 Gardiner & Chesneau 1980, p. 259. ^ Garzke & Dulin 1980, p. 73. ^ David 2015, p. 881. ^ Dumas, Dunkerque 2001, p. 24. ^ 19.0 19.1 19.2 Dumas, Dunkerque, p. 67–68. ^ 20.0 20.1 20.2 Whitley 1998, p. 50. ^ 21.0 21.1 Jordan & Dumas 2009, p. 66. ^ Jordan & Moulin 2013, p. 178. ^ Dumas, Richelieu, p. 50. ^ Dumas, Dunkerque, p. 68–69. ^ Rohwer 2005, p. 29–30. ^ Dumas, Dunkerque, p. 69. ^ Jordan & Dumas 2009, p. 83. ^ 29.0 29.1 Dumas, Dunkerque, p. 73. ^ Jordan & Dumas 2009, p. 84. ^ Jordan & Dumas 2009, p. 89-90. ^ Jordan & Dumas 2009, p. 86. ^ Dumas, Dunkerque, p. 74. ^ Dumas, Richelieu, p. 37. ^ History of the Second World War, p. 1242. ^ Whitley 1998, p. 52. ^ 37.0 37.1 37.2 37.3 Jordan & Dumas 2009, p. 93. ^ Garzke & Dulin, p. 54. ^ Garzke & Dulin, p. 55. ^ Dumas, Dunkerque, p. 75. David, T. Zabecki. World War II in Europe: An Encyclopedia. UK: Routledge. 2015. ISBN 9781135812423 （英语）. Dumas, Robert. Le cuirassé Richelieu 1935–1968. Nantes: Marine Éditions. 2001. ISBN 978-2-909675-75-6 （法语）. Dumas, Robert. Les cuirassés Dunkerque et Strasbourg. Nantes: Marine Éditions. 2001. ISBN 978-2-909675-75-6 （法语）. Gardiner, Robert; Chesneau, Roger. 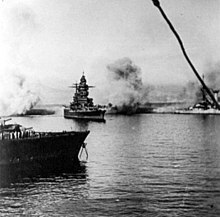 Conway's All the World's Fighting Ships, 1922–1946. Annapolis, MD: Naval Institute Press. 1980. ISBN 0-87021-913-8 （英语）. Garzke, William H.; Dulin, Robert O. Allied Battleships in World War II. Annapolis: Naval Institute Press. 1980: 391. ISBN 9780870211003 （英语）. Garzke, William H.; Dulin, Robert O. Battleships: Axis and Neutral Battleships in World War II. Annapolis: Naval Institute Press. 1985. ISBN 978-0-87021-101-0 （英语）. Garzke, William H., Jr.; Dulin, Robert O., Jr. British, Soviet, French, and Dutch Battleships of World War II. London: Jane's. 1980. ISBN 0-7106-0078-X. Giorgerini, Giorgio; Nani, Antonio. Le Navi di Linea Italiane 1861–1969. Roma: Ufficio Storico della Marina Militare. 1973 （意大利语）. Gröner, Erich. German Warships: 1815–1945. Annapolis: Naval Institute Press. 1990. ISBN 978-0-87021-790-6. OCLC 22101769 （英语）. Imperial War Museum. History of the Second World War. World War, 1939-1945. Volume 3. Purnell and Sons Limited. 1967. Jordan, John; Dumas, Robert. 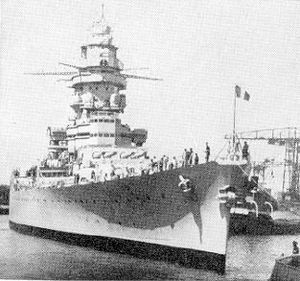 French battleships 1922–1956. Seaforth Punblishing. 2009. ISBN 978-1-84832-034-5 （英语）. Jordan, John; Moulin, Jean. French Cruisers: 1922-1956. Seaforth Publishing. 2013. ISBN 9781848321335 （英语）. Labayle-Couhat, Jean. French Warships of World War I. London: Ian Allan. 1974. ISBN 978-0-7110-0445-0 （英语）. Le Masson, Henri. The French Navy Volume I. Navies of the Second World War. London: Macdonald. 1969. ISBN 0-356-02384-2. Preston, Anthony. The World's Worst Warships. London: Conway Maritime Press. 2002. ISBN 978-0-85177-754-2. Robertson, Stuart; Dent, Stephen. Conway's The War at Sea in Photographs 1939–1945. London, UK: Conway Maritime Press. 2007. ISBN 978-1-84486-045-6 （英语）. Rouxel, Jean-Christophe. Officiers et anciens élèves - Jean de LABORDE. 2014 [2017-10-15]. Rohwer, Jürgen. Chronology of the War at Sea, 1939–1945: The Naval History of World War Two. Annapolis: US Naval Institute Press. 2005. ISBN 1-59114-119-2 （英语）. Vader, John. The fleet without a friend. New English Library. 1973: 160. ISBN 978-0450012266. Whitley, M. J. Battleships of World War II. Annapolis: Naval Institute Press. 1998. ISBN 1-55750-184-X. Archibald, E.H.H. The Metal Fighting Ship in the Royal Navy 1860–1970. London: Blandford Press. 1971. ISBN 978-0-7137-0551-5 （英语）. Lenton, H. T. German surface vessels 1. London: Macdonald & Co Publishers. 1966 （英语）. Lenton, H. T. British battleships and aircraft carriers. London: Macdonald & Co Publishers. 1972. ISBN 978-0-356-03869-8 （英语）. Amiral Lepotier. Les derniers cuirassés. Paris: Editions France-Empire. 1967 （法语）. Macyntire, Donald G.F.W. ; Bathe, Basil W. Les navires de combat à travers les âges. Paris: Stock. 1971 （法语）.